It is curious that while eleven men have been to the moon, only three have been to the deepest recesses of the ocean. The Challenger Deep at the southern end of the Mariana Trench is the deepest point on Earth – nearly 36,000 feet below sea level. For comparison, Mount Everest, is 29,000 feet. The water pressure at this depth is an incredible 1,099 pounds per square inch. The Challenger Deep was discovered in 1875 by the scientific expedition of HMS Challenger, which made the first measurements of its depth. Since then, the Deep held the imagination of the public enthralled. To the Deep by Balloon? It was only in 1960 that the first manned descent was made possible by the Swiss physicist Auguste Piccard. The scientist was known for experiments with helium balloons. In fact, he designed and manned a balloon to a record height of 51,775 feet in 1931. 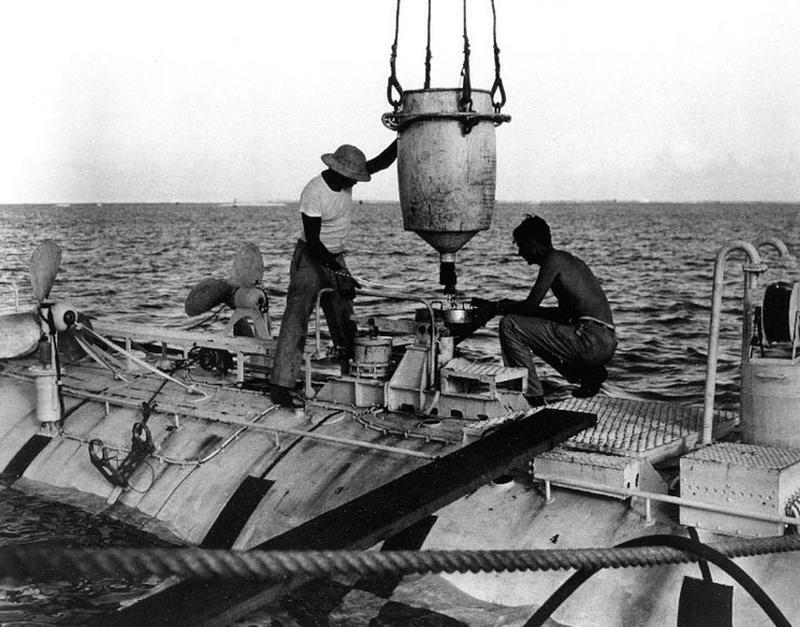 By the late 1940s, Piccard developed a bathyscaph. It worked on the principles of a hot air balloon, but instead of soaring into the skies, the bathyscaph would descend to the deeps. A large float acting as a “balloon” was secured above a spherical observation chamber. Instead of helium inside the balloon, the float was filled with tons of gasoline. 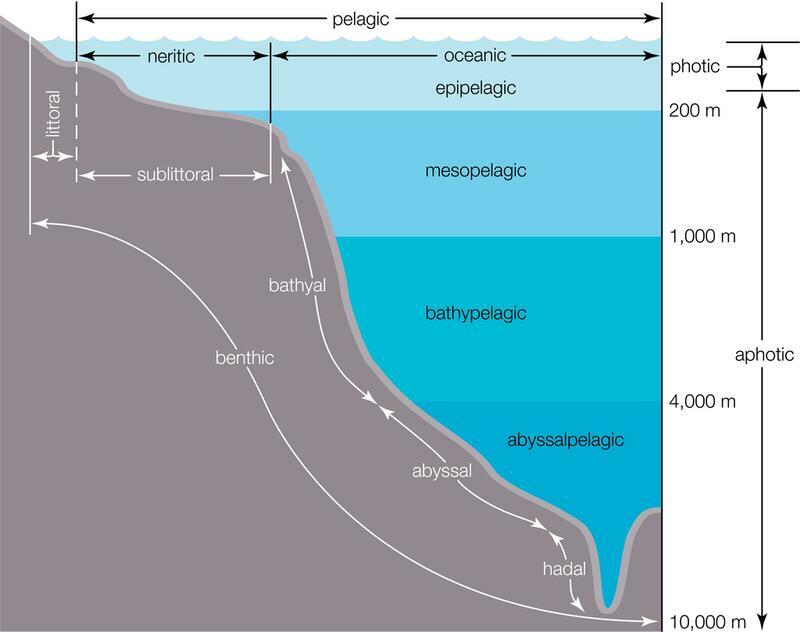 Gasoline is lighter than seawater (think of oil sitting atop a pool of water) and imparts positive buoyancy to the bathyscaph, allowing it to rise. For ballast, Piccard opted to use tons of iron shot. Piccard tinkered with his invention, going through several models. He finalized a solid design which was primarily built in and with the support of the city of Trieste. The bathyscaph was named for the city and launched on August 1, 1953. 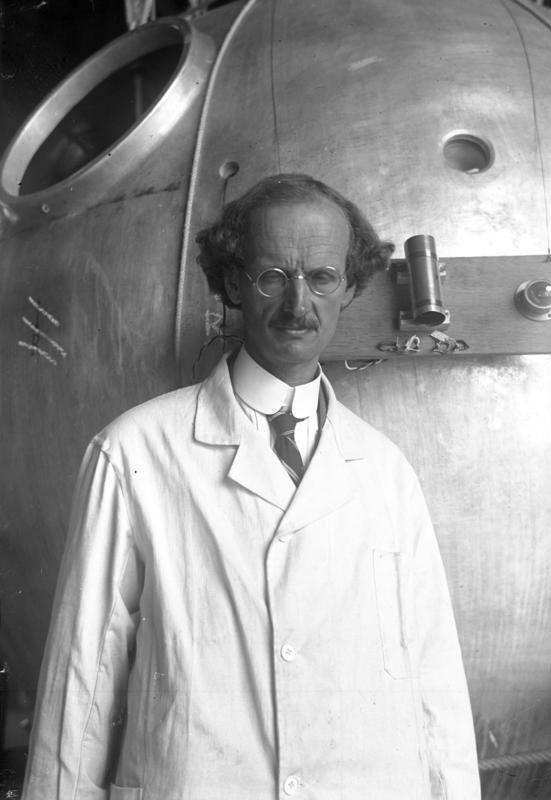 Auguste Piccard’s son, Jacques, became one of the primary test pilots of new submersible. Tests were conducted in the Mediterranean with the Trieste achieving a depth of 12,110 feet. Bathyscaphe Trieste. (Source: Retrieved from NH 96801 U.S. Navy Bathyscaphe Trieste (1958-1963), Art collection, U.S. Naval History and Heritage Command website. Released by the U.S. Navy Electronics Laboratory, San Diego, California.) Wikipedia. 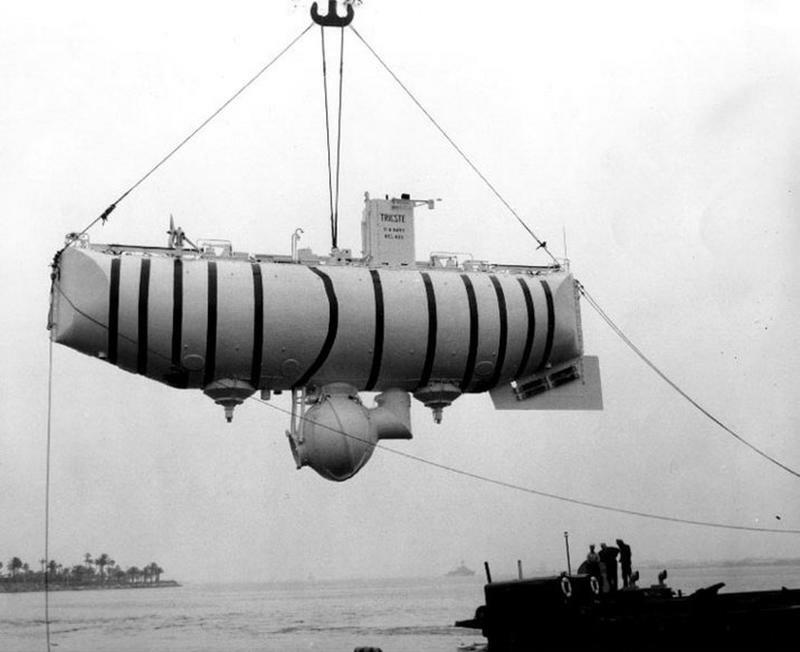 These successes peaked the interest of the U.S. Navy which purchased the Trieste as the key element of Project Nekton, a series of diving experiments meant to take humanity to the most extreme depths. Jacques Piccard was excited for the American involvement since they offered the best opportunity to conquer the Challenger Deep. 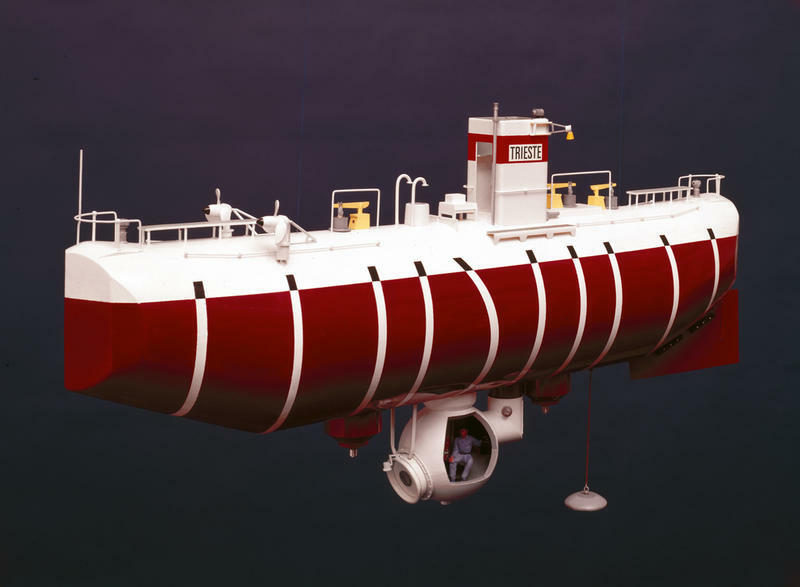 To prepare for Challenger Deep, the Trieste was modified. 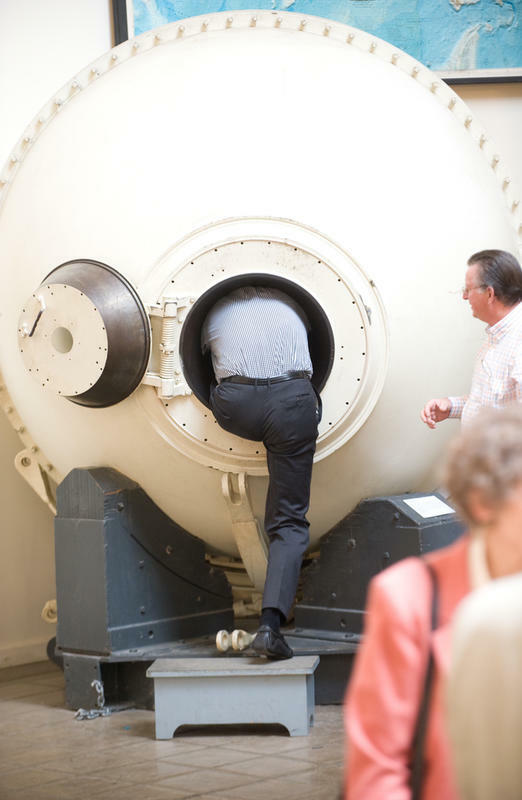 The Navy installed a stronger observation sphere with five-inch thick steel walls that weighed over 14 tons. This required a larger float. They also added 20,000 pounds of iron shot ballast held by electromagnets. If the Trieste’s power failed then the shot would automatically drop, and the bathyscaph would rise to the surface. The Trieste headed to Guam, near the Mariana Trench. Test dives were made with great care to depths of 24,000 feet. To communicate with the divers, surface tending ships used an UQC, an underwater acoustic telephone that operated via soundwave. The Challenger Deep qualified as a special problem and Piccard was to dive with Walsh. Meanwhile, the seas were rough (up to twenty feet). The dive had already been delayed a day and there were thoughts of calling it off longer. But all systems on the Trieste checked out and Piccard and Walsh agreed. The dive was on. At 8:23 a.m. on January 23, 1960, the Trieste slipped into the sea. The heavy roll of waves was replaced by an eerie stillness. The dive at first was slow so that by 9:00 a.m. they had only reached 900 feet. The Trieste was buffeted by the thermoclines, those regions of temperature variations. But after adjustments, they sunk lower and entered a region of twilight, the bathyal zone. Walsh and Piccard saw by the arc lights of the Trieste, plankton streaming upward as they descended at three feet per second. At 9:20 a.m. Piccard and Walsh had reached 2,400 feet. All light from the surface was being lost, then soon it was gone altogether. They had entered the abyssal zone. They dimmed their cabin light to adjust their eyes to the dark. 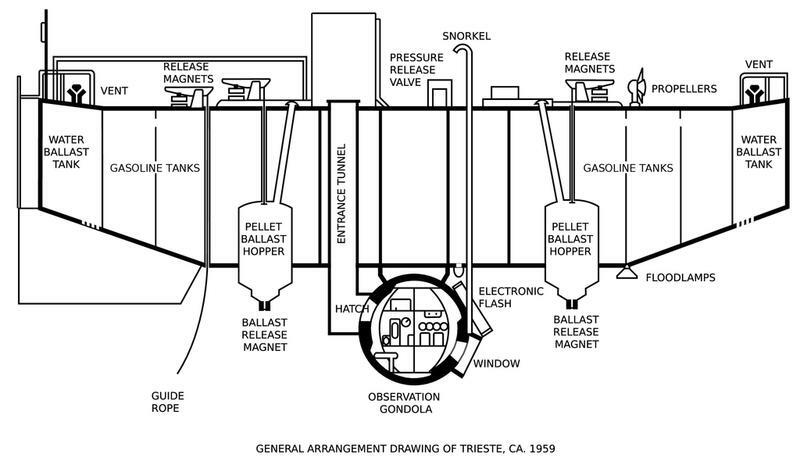 A chill permeated the Trieste as the temperature inside the chamber slipped to 45 degrees Fahrenheit. Both men slipped into dry clothes to keep warm and ate chocolate bars, their only sustenance. But it was hard to stay warm since they could barely move, the sphere was only a few feet in diameter. At 9:29 a.m. they were at 4,200 feet when a small leak started. But this was quickly sealed as the mounting water pressure tightened its hold on the Trieste. By now they were dropping about 200 feet a minute. Soon, a second small leak started. It didn’t go away, but also didn’t present a danger. At 11:30 a.m. they had reached 27,000 feet. They were now in the hadal zone, the deepest region of Earth’s oceans. The water was clear. Piccard wrote, “This was a vast emptiness beyond all comprehension.” Communications with the surface with the UQC were limited to signals. Walsh sent up a message that all was well. The Trieste quietly descended until at at 32,400 feet the men heard a startling explosion. Have we touched bottom?” Walsh asked. “I do not believe so,” Piccard replied. They performed some tests. All seemed in order. They kept going deeper. Piccard and Walsh dropped 800 pounds of ballast and began the long ascent to the surface. While at first their surfacing was slow as time passed they ascended faster and faster. The Trieste’s superb design held and so did the cracked porthole. Jacques Piccard and Don Walsh surfaced at 4:48 p.m., two minutes ahead of schedule. 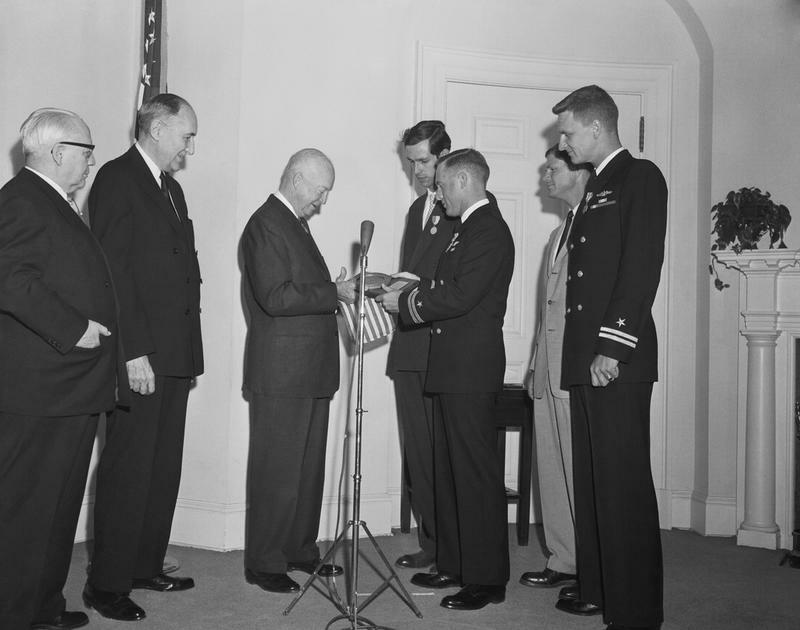 For their deed, Piccard and Walsh were awarded by President Dwight Eisenhower the Navy’s Distinguished Public Service Cross and the Legion of Merit respectively. Both men would become legends in the history of diving and exploration. 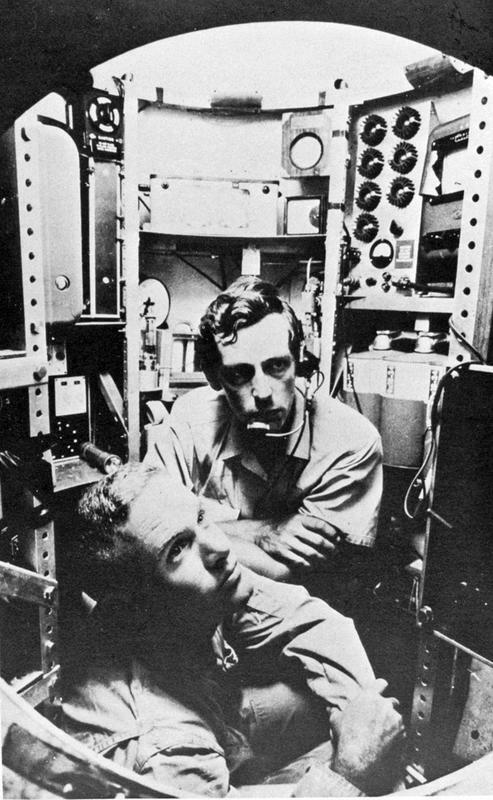 Since Piccard and Walsh, there have been three unmanned probes sent to the bottom of the Challenger Deep. 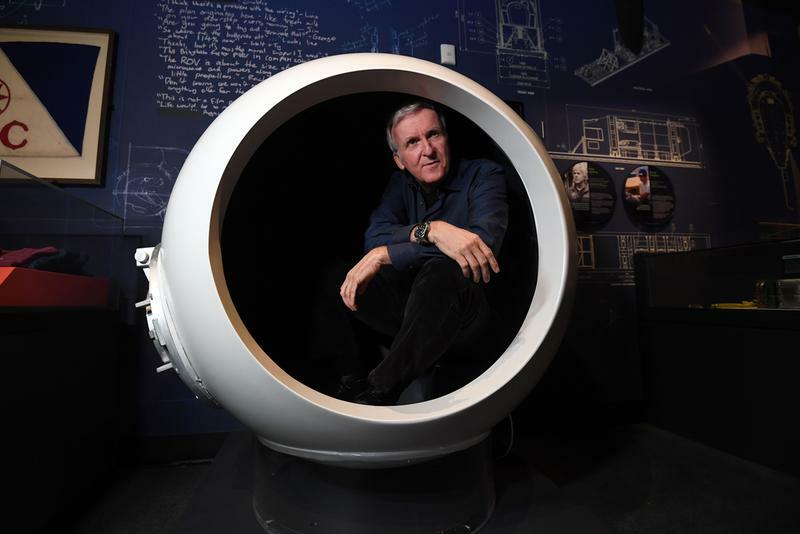 But perhaps the most famous descent was made by director James Cameron (of Avatar and Titanic fame) who in 2012 descended in the Deepsea Challenger for the first solo descent. Cameron made a popular documentary of the descent. Subsequent unmanned probes have not only given us insight into life in this harsh environment, but also have shown us how even this most remote of region cannot escape human activity. Recent studies have revealed extremely high toxin concentrations of PCBs in the Challenger Deep. Don Walsh, in particular has become an advocate for the continued exploration of the deeps in order to understand changing climate today. Today, several firms are working on new equipment and devices that will make this extreme descent more accessible to scientists, explorers, and perhaps eventually the general public. Joseph A. Williams is the author of Seventeen Fathoms Deep: The Saga of the Submarine S-4 Disaster and The Sunken Gold: A Story of World War I, Espionage, and the Greatest Treasure Salvage in History. 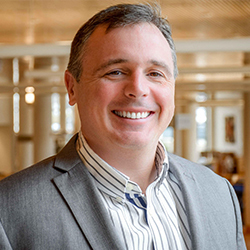 He is currently the Deputy Director of Greenwich Library (CT).